Ugandan soldiers serving with the African Union Mission in Somalia (AMISOM) prepare to deploy near the Somali capital of Mogadishu in an area that became home to a large refugee population (file photo). President Yoweri Museveni has threatened to withdraw his country's forces from the peacekeeping mission in Somalia if the United Nations insists on reducing the number of troops on the mission. Due to declining and irregular funding, the UN Security Council, in Resolution 2372 of 2017, proposed a phased drawdown of peacekeepers in Somalia with a full pullout by 2020. The Ugandan president, who has recently become critical of the UN, said he had personally informed the Security Council that Uganda would withdraw its 6,400 contingent from Somalia if it is forced to scale down. This comes after Burundi's Pierre Nkurunziza threatened to pull out of Amisom if the funders of the mission insist that Bujumbura recall its 1,000 soldiers. Mr Museveni, while addressing a high-level meeting of ministers in charge of refugees in the Great Lakes Region in Kampala on Thursday, said the Security Council's move was a "total lack of seriousness" to the task of flushing Al Shabaab out. "They recommended I should reduce the number of soldiers but I will not reduce even a single one, unless I take all of them out of Somalia," Mr Museveni said. Uganda is the largest troop-contributing country to Amisom, with more than 6,400, of the total 21,626 soldiers. The troop-contributing countries have said that this number is smaller than what is required to fully pacify Somalia and have been advocating a troop surge instead. Mr Museveni told the High Level Ministerial Meeting of Ministers in charge of Refugees in the Great Lakes region at Munyonyo in Kampala that his efforts to convince UN secretaries general Ban Ki-Moon and his successor António Guterres were rebuffed. "Because the numbers are small, we are only in urban centres and streets while Al Shabaab is taking over the countryside," he said. Mr Museveni becomes the second leader of a troop contributing country to threaten a full withdrawal instead of a scale-down after Mr Nkurunziza, who believes that his country is being targeted by the EU. Burundi insists that withdrawal should be done uniformly by all troop-contributing countries. Burundi's Defence Minister Emmanuel Ntahomvukiye said last month that his country would withdraw all its soldiers from Amisom if the AU does not reconsider an order to withdraw 1,000 troops from the Shabelle region. Burundi's threat was triggered by an announcement by the AU that it would cut 1,000 troops by February 28, 2019, in line with the new Amisom operations blueprint known as the Concept of Operations (ConOps). Under ConOps, some operating bases are to be reconfigured and others closed as troop numbers fall. It is not yet clear whether both the UN and AU will have a change of heart in scaling down the Amisom after the threats by these two countries. But there are fears that it could give Al Shabaab an added advantage to rebuild, recruit and restructure. 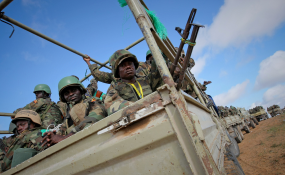 The insurgents have on many occasions regained control over areas that have been vacated by Amisom and it is from here that they launch attacks on the capital Mogadishu and neighbouring countries. Some analysts, however, say that the money the troop-contributing countries receive could be the reason for their resistance to the drawdown. According to President Museveni, pulling the peacekeeping force out of Somalia should be done after the host country has built a strong enough army to defend itself. The challenge here is that Mogadishu has no money to build a large army but Mr Museveni, himself a former rebel, thinks payments can wait if the government considers recruiting volunteer patriotic nationals willing to liberate their country.